Omni-channel retail solutions for the enterprise. Your Business Vision...Delivered. Our tagline AND our core philosophy. Let us help you deliver your business vision to enable your customers to buy from you any way they want. POS, Call Center, Web, Mobile, Kiosk, Voice AI(bots) and all future devices. 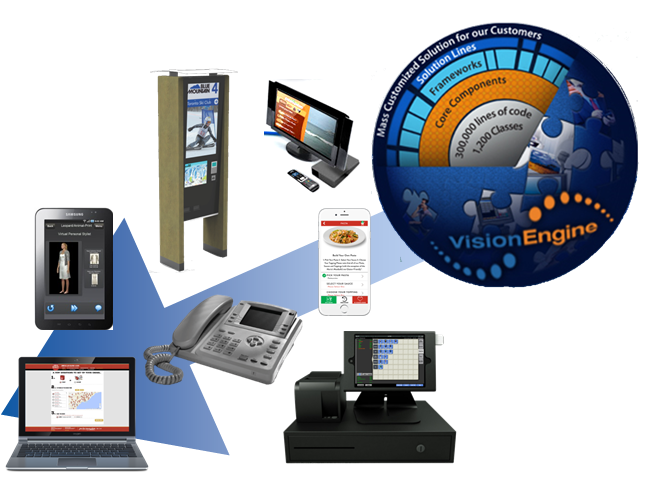 VisionMAX, our VisionEngine & VESB platforms with our VECOM software does that! 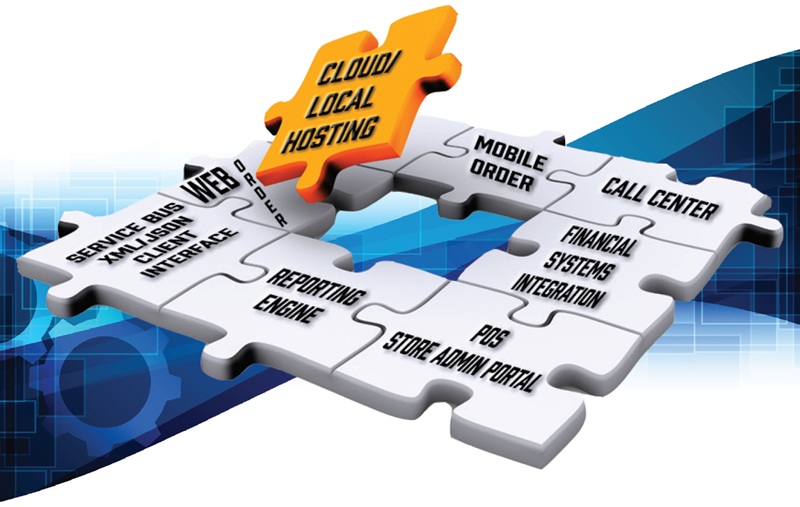 Cloud-hosted across multiple data-centers removes the burden of infrastrucuture, maintenance and support. Browser-based application means no remote management - you always have the latest software. One self-installing/updating local file and you are ready for off-line mode. One database and API for a single view of your data no matter what device or location. Enterprise Event management proactively monitors, predicts and prevents potential issues before they happen - smart analytics. @vmaxsolutionsVisionMAX has become an integrated, reliable part of our service delivery team with an exceptional track record of delivery. They are consistently able to understand our business goals and deliver innovative solutions in a complex technical environment. Our people really enjoy working with their team. An order placed on a customer's mobile phone is instantly printing on the kitchen printer or recipe being prepared from the Kitchen Display System. 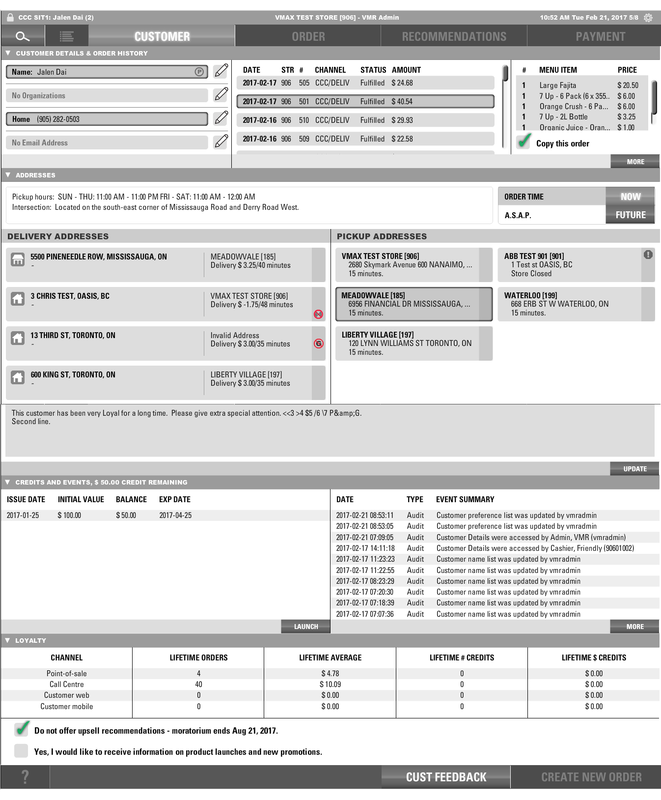 Call center agents can see the order and note how many orders are in queue to adjust the delivery lead time for all channels. The customer's family can track the order on their interactive TV, or laptop and google home can give you a play by play as the order is driven up your driveway. In-store kiosks help move the lines faster with staff focued on the fulfilment of the orders. Digital signage and menu boards let customers know exactly when your order is ready. Scan the customer's items from their shopping cart, place a special order for a custom product from one of your suppliers that includes engraving a message their profile has their address book shipping details to place the remote order and save the courier tracking number for anytime tracking, order is paid for with a tap of your apple-pay with the email receipt instantly sent out. Have your staff pick the lumber order for the construction forman that placed their just-in-time order from the job site on his mobile. When he arrives, your staff help put the lumber and drywall into his flatbed (or have it delivered choosing from pre-allocated available timeslots). VisionMAX delivered over 150 bilingual screens as well as 50 system reports in less than 3 months using the VisionEngine Platform! We were amazed at the speed at which VisionMAX's tools could deliver an application. Use one or use all of the integrated pieces. Our solution is modular to fit with your business challenges. Don't need a kiosk now, but may someday, then deploy when you need it. We call our process Mass-Customization - for 20 years we have built software that was not yet invented, our VisionEngine and VESB enabled us to rapidly build custom enterprise solutions. Our common denominator over the last 20 years has been our E-commerce, POS, and nearly 20 years of wireless development (starting with WAP for those that may remember). VECOM is the culmination of 10's of millions of development effort towards a stable reliable platform that will process 100's of thousands of transactions an hour. Your invesment with Visionmax is based on a solid foundation. When it comes to understanding our unique challenges and designing creative solutions to meet our business goals, VisionMAX has consistently delivered in exceptional fashion over the last 6 years. Most of all, they deliver peace of mind. What are people saying about VisionMAX? We enjoyed working with the VisionMAX team and with our partners Sprint USA to help deliver Integrated Digital Video on Demand Solutions to the Hospitality Industry. Visionmax has been a trusted partner across the Canada /U.S. Border and has provided exceptional consulting and development services for us! Congrats again to your team for a) a successful application build over many months of changed requirements and b) for a successful, uneventful launch this weekend. You guys are truly rock solid vendors – I’m proud to have worked with you, sincerely!!! We have looked to VisionMAX to provide innovative, reliable, custom solutions over the last 7 years. We’ve built a successful brand new business around the solutions they have developed for us! I have very positive feelings towards you and the staff of your company. Of all the vendors I have worked with, VisionMAX is the one most determined to deliver and most willing to stand behind their product. for your customers and staff?